There are plenty of things to like about the Cooks Standard Multi-Ply Clad Stainless-Steel 10-Piece Cookware Set. For starters, it has a really attractive price tag when it comes to quality stainless steel cookware. For less than $200, you can have this set that includes six useful pots and pans and their respective lids. Some of the features I liked in this set include the ability to cook on an induction range, the uniquely designed handles that actually stay cool and the high oven safe heat. Read the rest of my findings to see if this is the cookware set for you! The Cooks Standard Multi-Ply Clad Stainless-Steel 10-Piece Cookware Set is made of triple ply construction. What this means is that there are multiple layers of metal that make up the pots and pans. In this case, there are three layers of metal: an interior and exterior layer of 18/10 stainless steel that encapsulates multi-element alloy aluminum core. Important to note is that the aluminum core isn’t just found at the bottom of the pans, it also goes up the sides. This is important, as it means more even and thorough heat distribution, since stainless steel on its own isn’t a great conductor of heat. Generally speaking, this type of construction (with the aluminum extending up the sides), is found in better quality cookware such as the popular All Clad line. The stainless steel set has a brushed stainless steel exterior with riveted, stainless steel handles. Each of the handles also have loops at the end, useful for hanging from a pot rack when not in use. The pots and pans comes with matching, tight fitting stainless steel lids. Many cookware sets found for sale today can be used on just about any surface but induction cooktops. Not so with the Cook’s Standard Stainless Steel set. The set has a scratch-resistant stainless steel base, and can safely be used with any type of stove surface, including induction surfaces. While many company’s claim that their stainless steel pot handles stay cool during use, this set actually delivers on that promise. The handles are riveted for durability and strength and feature a unique ergonomic design. 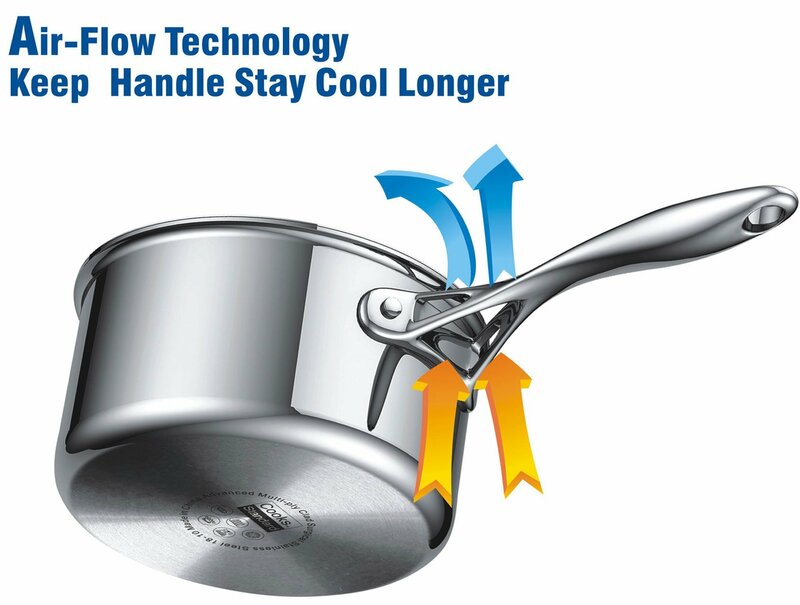 They are not only comfortable to use, but the special v-shaped design allows for increased airflow, which really does help to keep them cooler than similar cookware handles. Several consumer reviewers confirmed the handles definitely stayed cooler than other sets they’d used. If washing dishes by hand isn’t on your list of favorite after dinner activities, you’ll be happy to know that the Cooks Standard Stainless Steel cookware is dishwasher safe. The set is easy to clean regardless of how you choose to wash it. Need to start dinner on the stove and finish it off in the oven? No problem with the Cooks Standard Multi-Ply Clad Stainless-Steel 10-Piece Cookware Set. The set is oven safe up to 500° F. It’s important to note that the set is not broiler safe, however. If you run into a problem with your stainless steel cookware set, simply contact the manufacturer. There is a lifetime limited warranty on this 10 piece set. Many people may wonder why stainless steel is so popular as a cookware metal, when it isn’t a particularly great conductor of heat. The answer lies in its durability. Stainless steel pots and pans are incredibly resistant to scratching and denting. It’s fairly easy to get little dings or utensil marks on cookware with continued use. Stainless steel just holds up a lot better to daily abuse than other metals. With the Cooks Standard set, the interior and exterior of the pieces are made with tough 18/10 stainless steel (sometimes also referred to as 316 stainless steel). Take care of this set, and you can expect it to serve you for many years. Cooks Standard Multi-Ply Clad Stainless-Steel cookware is dishwasher safe, though hand washing shouldn’t be a problem at all. Reviews by consumers indicated that the set is easy to clean up. 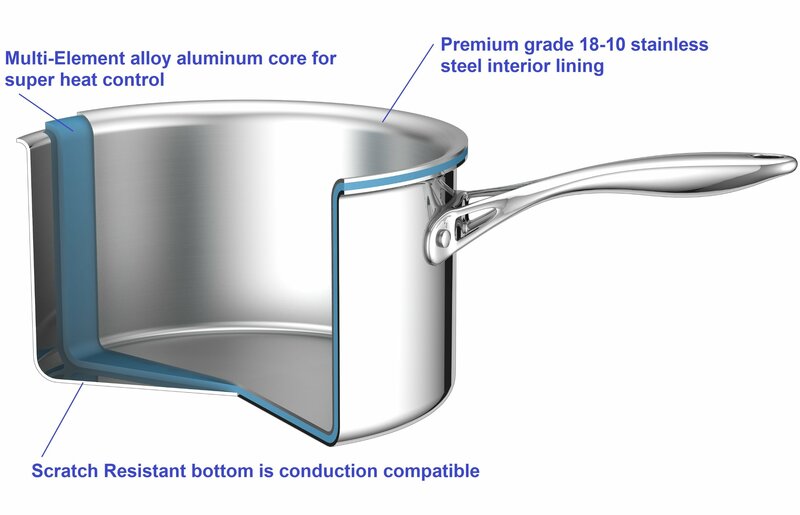 You will want to do some reading up on the best care for stainless steel pots and pans. Preheating and proper use of fats or oils help to make sure that food doesn’t stick in the first place. Also, lower temps can be used while cooking, which helps avoid burnt on messes. The Cook’s Standard Multi-Ply stainless steel set has been reviewed dozens of times on Amazon, and most consumers seem to be really pleased with the cookware set. The Cooks pots have been compared to other quality sets such as All-Clad and Cuisinart, but with notably better pricing. One reviewer was thrilled with the appearance of the set and stated that even after several weeks, the pots and pans still look new. Some of the other sets she considered when researching new cookware were the KitchenAid Gourmet Distinctions set and the Cuisinart 77-17 cookware. After reading various reviews, comparing pricing and features, she went with the Cook’s Standard set because it offered a better price than the other two and also seemed to have overall better reviews when it came to quality. The one complaint this reviewer had was that the instructions are poorly written, at best. Another reviewer also talked about the nice appearance, and stated that it’s easy to clean the set and keep them looking new. She’s noticed that while cooking, the handles do remain cool to the touch. This is a feature that seems hard to come by with stainless steel cookware. This reviewer stated that food cooks up evenly and she also likes the included steamer insert. There weren’t a whole lot of negative comments about the Cooks Standard set. One reviewer did find that, when used on an induction range, there was a noticeable buzzing sound. A couple of other reviewers stated that they had problems with food sticking. This could be caused by the technique being used while cooking foods that are known to stick, and is usually an avoidable problem. 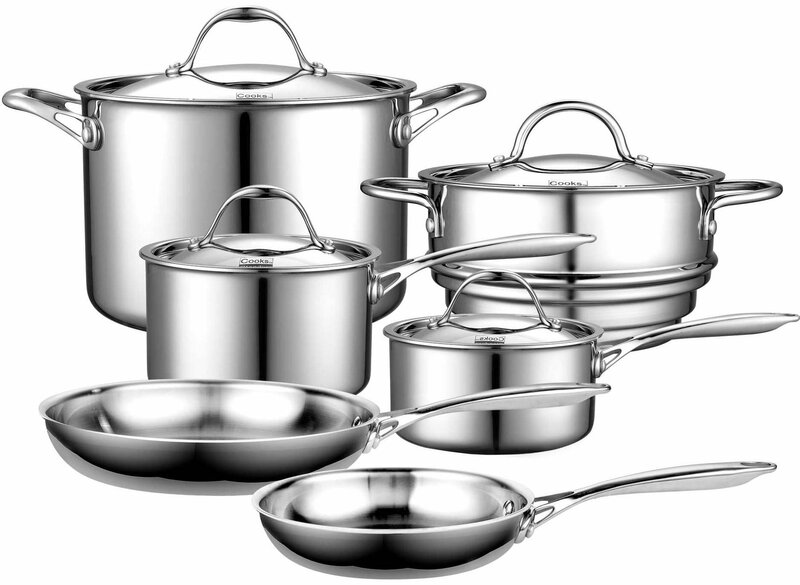 Overall, the Cooks Standard stainless steel set seems to really measure up when it comes to quality and price. Based on the reviews I’ve read and the overall ratings at Amazon.com, this is a set worth researching more.